The Hydro Life has a 4.5-inch impact resistant IPS LCD at qHD (960x540) resolution. The casing is reinforced (Military Standard 810G drop and shock protection) and there's a 5MP camera on the back. Inside is a 2,000mAh battery, which should be fine to keep this modestly specced phone running. It's also IP57 certified to survive up to 30 minutes in 1 meter of water. It's basically a less expensive version of the Brigadier on Verizon. The device will be sold through Walmart stores starting August 8th on T-Mobile. A MetroPCS version will be out on August 29th. Pricing is listed by Kyocera as $124.99. Seeing as T-Mobile doesn't do contracts, that would seem to be the full cost of the device. That's rather impressive if true, but Kyocera might just be confused too. Check out the full PR below. SAN DIEGO – August 4, 2014 – Many of us are suffering from "fragiphoniphobia" without even realizing it. The fear of fragile phones – and worries about drops and spills ruining our smartphones and disrupting our lives – prevents us from using them to their full potential. 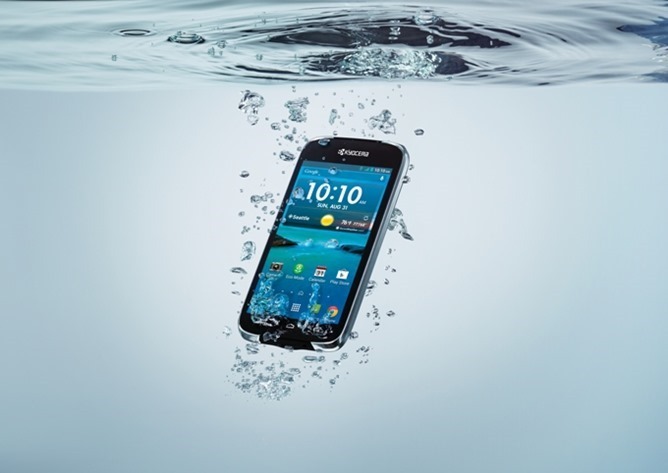 Enter Kyocera Hydro Life, a waterproof 4G Android™ smartphone that’s also Military Standard 810G drop- and shock-proof. The ideal smartphone for both active consumers and workers on the job, Hydro Life is available for T-Mobile customers at Wal-Mart starting August 8 for just $124.99 (+taxes & fees) with qualifying service. MetroPCS will also launch the Hydro Life on August 29.